The LG Ericsson LIP 8012D phone is the standard model in the LIP-8000 series IP range. It’s designed for everyday users and is very easy to use and operate. It’s feature rich and the 12 programmable buttons are more than enough for the majority of staff. For detailed information about the LG LIP 8012D phone please read below. The LG Ericsson LIP-8012D phone is the standard handset in the LG Ericsson LIP 8000 IP phone series unlike the premium LG LIP 8040 IP executive model. The difference between the two models is that the LIP-8012D has 12 keys on the right whereas the LIP-8040 phone drives everything from its large screen and the buttons surrounding it (also more expensive). For all intents and purposes it is basically the same as the LG Ericsson LIP-8024D phone but it offers users 12 fewer programmable buttons. For most staff this phone is probably the ideal choice as the cheaper LIP-8004d handset is very basic and has severely reduced functionality. It's more for waiting rooms etc. The handset is well conceived and all the main buttons are intelligently laid out and readily locatable - features like conference, voicemail, hold, mute, transfer etc. If you're using these handsets on the latest LG iPECS pbx systems (iPECS 50, iPECS 100, iPECS 300, iPECS 600, iPECS 1200) (not the LG Ericsson iPECS SBG-1000) you can still use the cheaper equivalent LG Ericsson LDP 7016 digital phone. It is non IP but still looks and operates in a very similiar manner, is cheaper and offers 4 more programmable buttons. The Ericsson LG LIP-8012D phone is easy to use and offers gigabit connectivity on your network for the type of speeds that help deliver the ultimate call quality on IP networks. As with all 8000 series IP phones, the LG LIP 8012D phone automatically configures itself as soon as it is plugged in which makes moving people around very straightforward. Staff so you can visually see who is free/ busy with the multicolour LED indicators. All these functions can be activated with a single touch. For example, if you answer a call and want to transfer it to another person just look for their name and see the status of the LED light. If they're free simply hit the corresponding button and then hang up to transfer the call. Simple isn't it. 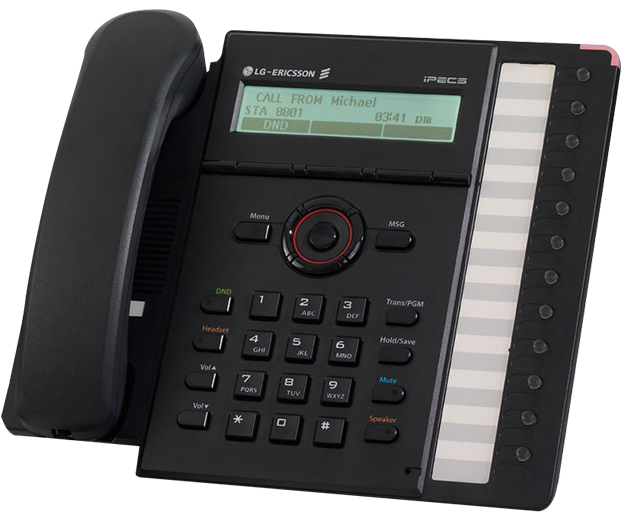 Like the LIP-8024D phone, the LIP-8012D phone offers users a jog dial control interface to let you browse the vast number of contact details the LG Ericsson iPECS phone system is able to store. It's just one more way LG Ericsson lets you perform common functions quickly and simply. The LG Ericsson LIP-8012E phone also has 4 menu buttons beneath the screen and the call these context sensitive. It really means that it's smart and depending on which features you are using at any given time it will display the most logical options. For example if you're on a call it would present options like, hold, transfer etc on screen. It makes using the LIP-8012D phone on a daily basis much easier. The LIP-8012D handset is part of the LG Ericsson LIP 8000 series which means they are compatible with the new LG iPECS phone system range (iPECS 50, iPECS 100, iPECS 300, iPECS 600, iPECS 1200) as well as the small business iPECS SBG-1000 phone system. The LIP-8012D phone would be the most popular handset in office deployments and only for the receptionist or larger companies would you need the larger IP handset models like the LIP 8024D phone or the LIP 8040L phone.